Laura Dubin -piano, Keiran Hanlon -bass, Antonio H. Guerrero- drums. Recorded July 2nd in Rochester, NY. If like me, you love modern jazz piano but at times weary of the fashionable trend to gloom and gravitas then here is a live set that will come as a refreshing antidote to the sometimes ponderous search for significance that pervades many contemporary releases. 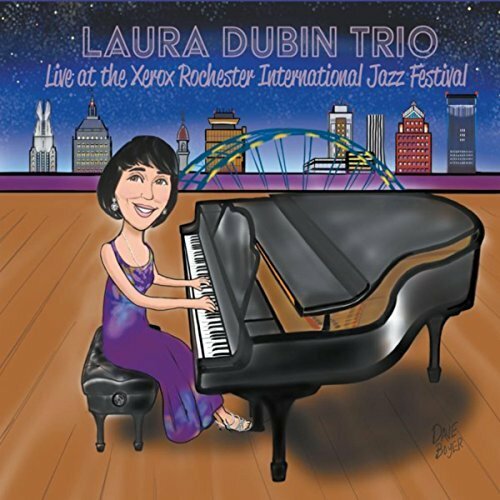 In the space of twenty-one tracks Laura Dubin thrills her audience with music that effectively assays the entire jazz piano scene taking in boogie-woogie, barrelhouse, stride, swing and bebop as well as more modern modal and ostinato driven styles whilst weaving in references to some familiar classical pieces with staggering verve and laugh out loud wit. Homages abound: you’ll hear references to many of the great practitioners of the art from Waller, through Garner to Camilo and Corea; the lyricism of Bill Evans, the baroque allusions of Nina Simone and the flat out swinging virtuosity of Oscar Peterson all feature within the excitingly diverse playlist ensuring the tempo never flags and the temperature rarely dips. Her facility in switching between these different styles and investing them with her own original imaginings calls for a formidable technique and the way she conflates songbook standards with classical pieces, an impressive musical intelligence. One particular example that stands out is a melding of Debussy’s `Reflets dans l’eau` with `Love is Here to Stay ‘in which the popular ballad emerges from the impressionistic prelude dripping in liquid arpeggios. Another highlight of this type is her hilarious rendering of Mozart’s `Rondo alla Turca` which combines boogie with Brubeck like braggadocio. You may be asking, where is Laura Dubin in all this, apart from the demonstration of technique and virtuosity: well along with the standards she does contribute eight of her own original compositions and though some of these are tributes reflecting the mannerisms of the particular dedicatee, others display an appetite for adventurous invention without being overtly radical. We have to remember that she is performing before a jazz festival audience who are out to be entertained and this she does royally. Both her drummer, Antonio H. Guerrero (a.k.a. Mr Dubin) and bassist Kieran Hanlon match her abilities in every way providing solid support and well-structured solo intervals that do nothing to impede the musical momentum but add enormously to its unflagging energy. It isn’t clear who is acting as distributor for this album but it is definitely one you should go out of your way to acquire because I’m confident that, just as those crowd funding investors who made its production possible can expect a handsome return, it will reward you the listener with dividends of pure pleasure.